Analysis of eye movement has the potential to improve educational efficiency because tracking gaze can be used to determined the areas on which operators concentrate their attention. Since few studies have focused on eye movement during endoscopic polypectomy, we tracked the eye movement of both experienced and novice endoscopists while they observed short videos on polypectomy. We evaluated gaze points and gaze duration of the subjects, especially when observing procedures for polyps. This feasibility study investigated whether eye tracking during endoscopic polypectomy is an effective tool for objectively evaluating skill. Two short videos (120 s, 3600 frames each) were prepared from a video of a colonoscopic polypectomy by an expert endoscopist. Video 1 showed the task of locating a polyp and Video 2 showed the task of endoscopic polypectomy using a snare. Study subjects were 1 expert endoscopist and 8 novices. Subjects were not informed about the position of the polyps before the observation and simply sat and watched the videos on a 32-inch LCD monitor. An eye-tracking system was used to detect the movement of both eyes at 30 Hz using two infrared cameras and displayed the position of the gaze point on an image of the visual field. Eye position relative to scene content was classified for each frame (1/30 s) as follows: polyp, snare loop, snare sheath, or other. Video 1: The target polyp appeared in 308 frames (10.3 s). The expert gazed at the polyp in 267/308 frames (86.7%), whereas on average, the novices gazed at the polyp in 94/308 frames (30.6%) (SD=18.8%). Video 2: The expert gazed at the polyp and the snare loop in 59.2% and 12.0% of the frames, respectively. On average, the novices gazed at the polyp in 44.0% (SD=7.5%) of the frames and at the snare loop in 22.0% of the frames (SD=8.1%). The expert found the target polyp earlier than the novices and did not look away from it. The expert also gazed at the polyp for about three times longer than the novices. The novices looked away from the polyp for longer periods than the expert. These results indicate that experts concentrate their attention more than novices on the target. 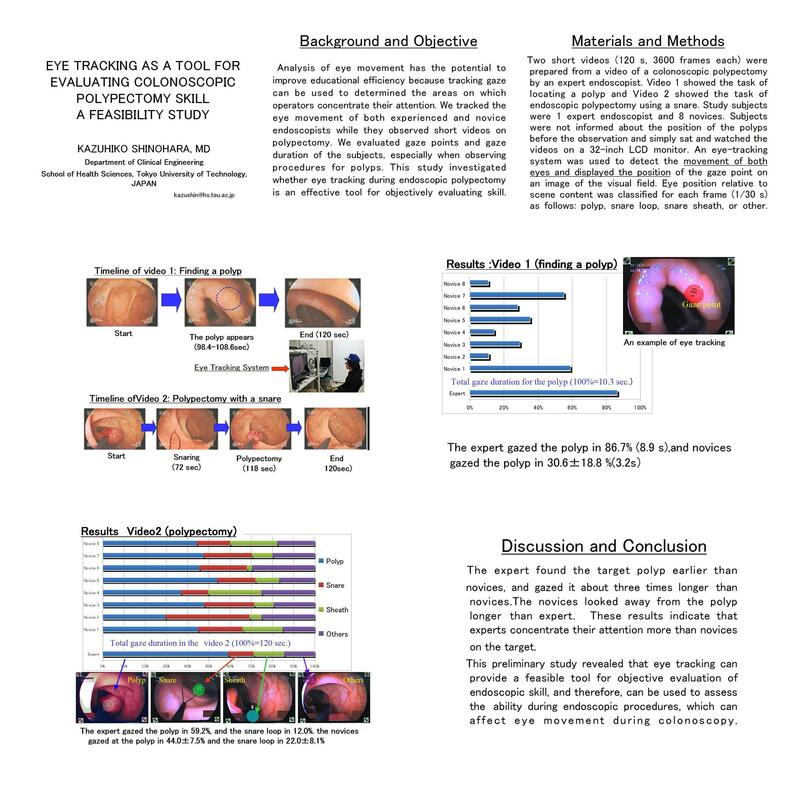 This preliminary study revealed that eye tracking can provide a feasible tool for objective evaluation of endoscopic skill, and therefore, can be used to assess the diagnostic and attentive ability during endoscopic procedures, which can affect eye movement during colonoscopy.